The area around Atlanta is beautiful and well worth exploring. Highlights include the Smoky and Blue Ridge Mountains, as well as a number of small towns with thriving museums, cultural venues and romantic getaways. For another taste of Southern big cities, Nashville and Birmingham provide different perspectives on urban centers in the region. Regardless of where one goes on a day trip outside Atlanta, the immediate vicinity will certainly not disappoint. Athens is the home of the University of Georgia as well as a thriving indie music scene. The city has a number of historical buildings with typical Southern architecture in addition to several 18th-century house museums open for touring. 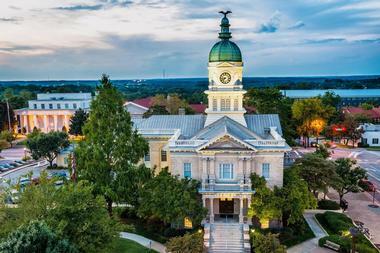 A college town, it is quite walkable and packs many venues into its small downtown area. 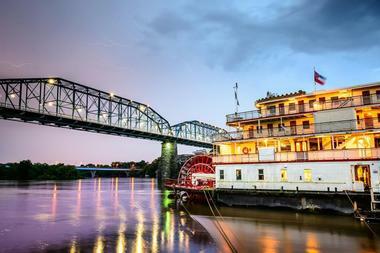 Chattanooga positions itself as an affordable tourist destination and presents a number of historical, natural, and cultural attractions. The city’s downtown is a historical site in its own right, with several Civil War monuments along its pedestrian Riverwalk. Stone Mountain Park is Georgia’s most-visited attraction, located just a short drive outside Atlanta at Stone Mountain, the largest granite formation in the world. Carved into this formation are the faces of important figures from the South, namely Stonewall Jackson, Jefferson Davis, and Robert E. Lee. In addition to its historical exhibits, the park is also an amusement park with a variety of thrilling rides for guests of all ages. Beyond the rides are a rope course and a four-story barn space. For an overnight stay, accommodation is also readily available at the nearby campground and numerous hotels located in the surrounding area. The Georgia Guidestones, popularly referred to as America’s Stonehenge, are a collection of large granite statues located atop a hill in Elbert County, Georgia. 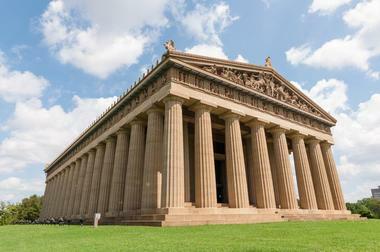 The composition is made up of five vertical columns that hold up a central capstone which is a towering 19 feet tall. Each of them is engraved with ten guidelines in twelve different languages: eight modern and four ancient. The guidelines, which are phrased as commandments, are meant to provide advice for living wisely in the world. The origin of the Guidestones remains an eerie mystery, as no one knows who actually commissioned the landmark. 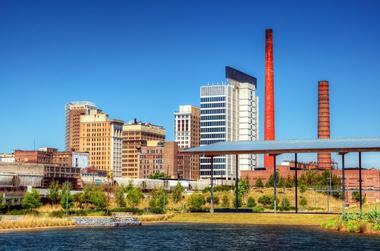 Birmingham is the most populated city in the state of Alabama and an important major metropolis in the American South. The city was founded in 1871 and quickly began to develop thanks to the fact that it was home to significant limestone, iron, and coal resources, all of which are necessary for the production of steel. 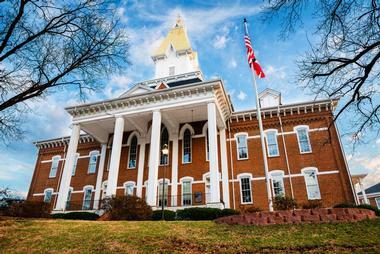 Dahlonega’s quaint downtown is listed in the Historic Register, and the community celebrates its history with a number of museums and tours. It is also known for its many festivals, which are dedicated to its rich past and fortunate place among the surrounding nature. 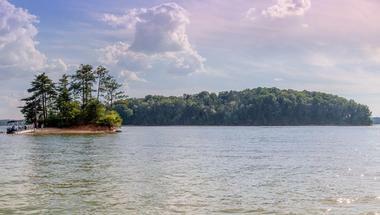 Lake Lanier is a manmade reservoir that was created when the Chattahoochee River was dammed in 1956. 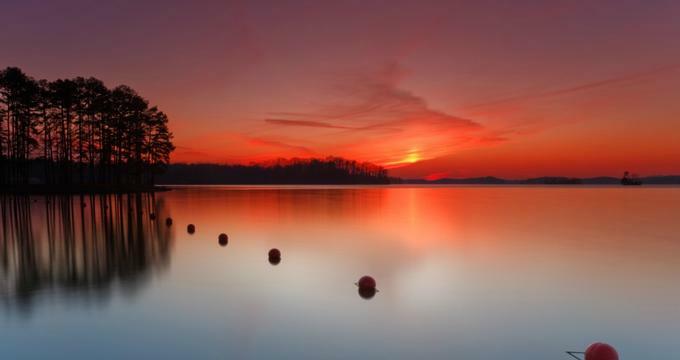 Originally a project to control the flooding of the river and provide water for the city of Atlanta, today the lake is a recreational center where lovers of the outdoors can enjoy swimming, boating, and water sports. Several parks are located just off the lake, and there are also a number of forest hiking trails nearby. Thrill seekers can try jet skiing out on the water or zip lining through the trees above, while those looking for a more laidback afternoon can try fishing or soaking up some rays on the sandy banks. 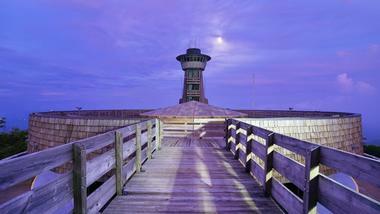 Mableton is a suburban town of 20,000 people located just outside downtown Atlanta. One of its main attractions is the Mable House, which includes a historic home and a performing arts center in one building. Despite its small size, Mableton has five parks for picnicking, sports, strolling, and soaking up the sunny Georgia weather. Another attraction is the Silver Comet Trail, a hiking trail that runs along the route of the old Silver Comet railroad line all the way out to the Georgia-Alabama state line. Mableton also has a wide selection of restaurants with both home-style and contemporary menus for visiting foodies to enjoy. 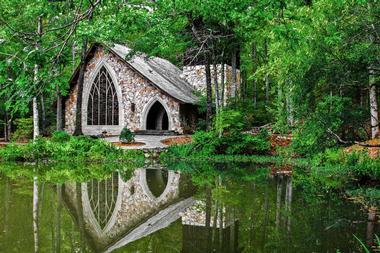 Callaway Gardens is an outdoor recreational area outside Atlanta, Georgia, that has activities for the entire family. The extensive property of the gardens includes several lakes that have boating, fishing, and watersports facilities as well as beaches for relaxing. Dining and shopping options are also scattered throughout the territory for easy access to the fun. But what really draw the crowds to Callaway are its many natural exhibits. Standing on the campus of Toccoa Falls College, Toccoa Falls is a towering 186 feet tall, making it one of the highest cascades east of the Mississippi River. Although technically on the college campus, the falls are secluded in a separate area surrounded by cliffs and tucked away from the institution’s academic buildings. A private path leads to their base, from which a fantastic view of the area opens up, making for a lovely photo opportunity. 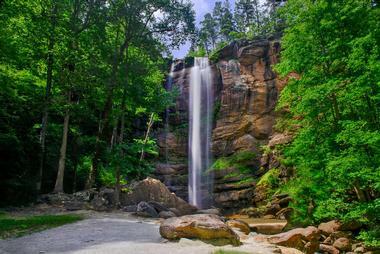 The cascade is often called the most beautiful waterfall in Georgia, which is appropriate given that the word Toccoa means beautiful in the Cherokee language. The tallest mountain in Georgia, Brasstown Bald, is quite a sight and presents stunning long-range views on clear days. 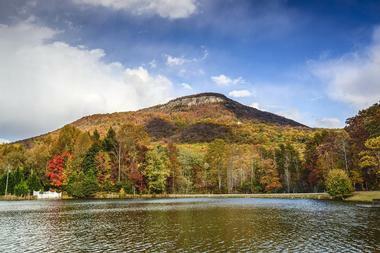 It spans the Appalachian and Blue Ridge Mountain chains in the northeastern part of the state. On high-visibility days, the four states of Georgia, South Carolina, North Carolina, and Tennessee are all visible from the top of this 4,784-foot peak. Its views change with the seasons, making it a worthwhile destination all year round. Brasstown Bald is accompanied by a small visitors center which has presentations on the history and ecology of the region in addition to its own gift shop. 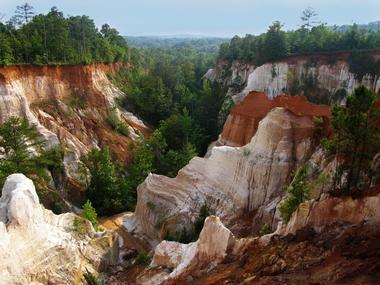 Providence Canyon, fondly referred to as the “Little Grand Canyon” of Georgia, was actually a geological error created by the improper farming techniques that were utilized in the 1800s. This land formation was a fortunate mistake, however, that has created some of the area’s most picturesque views. Most notable are the many pastel red, pink, and orange tones in the different layers of soil and rock in the canyon. 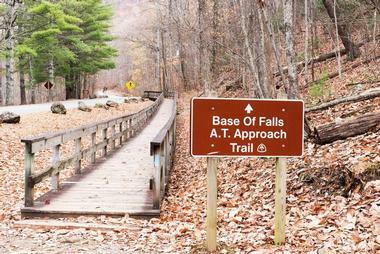 The park has many hiking trails, in addition to opportunities for climbing along the canyon face and camping nearby. A unique feature of Providence Canyon is that it is the world’s only home for the beautiful plumleaf azalea, which blooms here during the summer months. Fondly known as Music City, Nashville is without a doubt the country music capital of the United States. In keeping with this theme, the city has a number of music-related attractions, including the Country Music Hall of Fame and the legendary Grand Ole Opry. Chattahoochee National Forest blends seamlessly into another US preserved area, Oconee National Forest, to span across more than 867,000 acres of beautiful forest territory. This designated forest space has dedicated wilderness areas, miles of trails, and loads of opportunities for outdoor recreation activities. These include everything from hiking, horseback riding, hunting, and fishing to wildlife watching, picnicking, and rock and mineral collecting. One of the most famous sites in the forest is the Chattooga River, which creates its own beautiful views and is a popular white water rafting route. 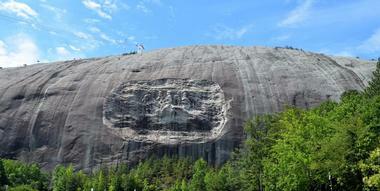 Other attractions include the Track Rock Gap Petroglyph Site and Scull Shoals Historic Site. 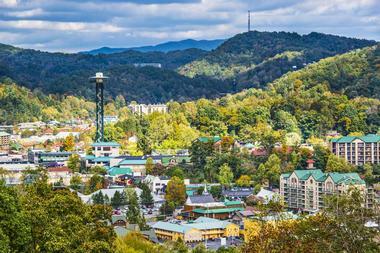 Gatlinburg, Tennessee, is a bit further away from Atlanta with a roughly four-hour drive, but it has much to offer as it is situated next to Smoky Mountain National Park, which offers 150 trails winding through 800 miles of gorgeous natural forestry. 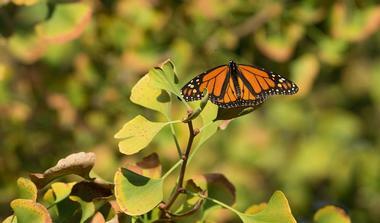 Piedmont National Wildlife Refuge is located in the central part of Georgia and provides a habitat for many species of flora and fauna in its wetland and forest environments. Although this land is fertile and well preserved today, overuse in the late 19th-and early 20th-centuries meant that it used to be barren. 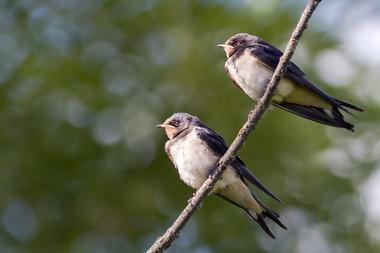 Some of the most famous inhabitants of Piedmont are beavers, wood ducks, turkeys, white-tailed deer, and the endangered red-cockaded woodpecker. 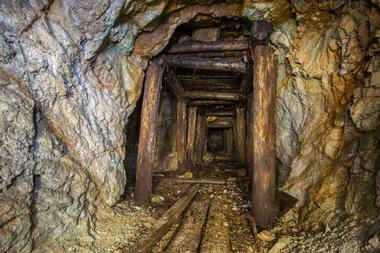 A trip to Consolidated Gold Mine in Dahnolega, Georgia, is a great way to experience the Gold Rush without having to take a trip back in time. The mine runs deep into the ground to a depth of 200 feet and offers tours, interactive experiences, and educational programs about both gold and gem mining. Tour guides explain the processes for mining, extracting, and refining these precious objects, and then guests are invited to try their own hands at panning for gold in the water and sifting through rocks in search of shiny rubies, emeralds, and amethysts, to name just a few of the stones featured here. Andersonville National Historic Site, which is run by the National Park Service, is an important historical landmark in the southern United States. It is here that Camp Sumter, a prisoner-of-war camp used by the Confederate Army in the final year of the Civil War, has been restored and maintained. During the war, more than 45,000 Union soldiers were held captive at the camp. 13,000 of them died, a testament to the poor conditions which led to high rates of diseases such as scurvy and dysentery. Today, visitors can take a look at exhibits connected to the site, a cemetery with the graves of the prisoners of war and the National Prisoner of War Museum, in order to gain a better understanding of the place this location holds in history. 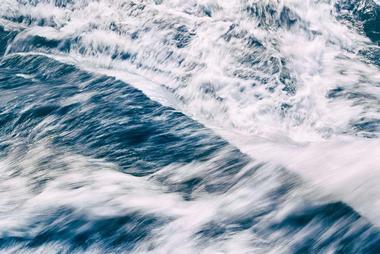 Anna Ruby Falls is a waterfall and recreational area located deep in the Chattahoochee-Oconee National Forest. Composed of two drops, one from Curtis Creek and one from York Creek, Anna Ruby Falls is accessible via a ½-mile-long asphalt trail and two longer unpaved forest trails. The falls have their own dedicated visitors center, which adds to the fun of a trip here. The center features a gift shop with local art and craft items for sale, snacks and drinks for purchase, and guided activities such as stargazing. Fishing aficionados can cast their bait into one of the creeks and see if they land a bite, while others might choose to enjoy a picnic in one of the designated areas under the falls. The National Museum of the Mighty Eighth Air Force is a museum-tribute to the Eighth Air Force of the United States, which served in Europe during World War II. The museum is located in Pooler, Georgia, a suburb of the city of Savannah. In its exhibitions, the National Museum of the Mighty Eighth incorporates curated information, artifacts, and personal accounts of the soldiers who served in the force. Of particular note are its collection of World War II-era aircraft and the outdoor memorial garden that stands next to the museum building and serves as a memorial to the veterans who served in the conflict. The Museum of Aviation in Robins, Georgia, has five venues with two main exhibition projects, namely its aircraft exhibit and its museum of aviation projects. 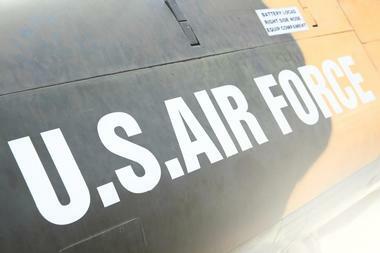 Situated close to the Robins Air Force Base, it is actually run by the military. As one might expect, the museum’s 93 airplanes are housed in two separate airplane hangars, while other exhibits have been placed in the other buildings in the facility. 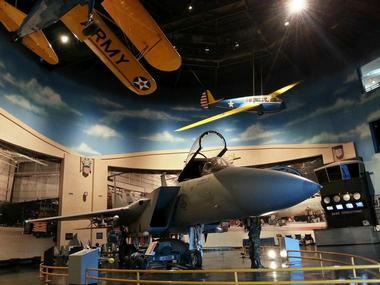 A unique characteristic of this museum is that its aircraft span a wide range of categories, including bombers, cargo planes, drones, and helicopters. Guided tours on the history of aviation are available, as are teacher training programs and team building exercises. Rock City Garden is the name given to a territory at the top of Lookout Mountain in Georgia. This area brings together many different natural attractions that showcase the gardens’ cliff formations, waterfalls, and caverns. All of these lie along the 4,100-foot-long Enchanted Trail, which runs along both natural scenery and manmade attractions for the entire family. 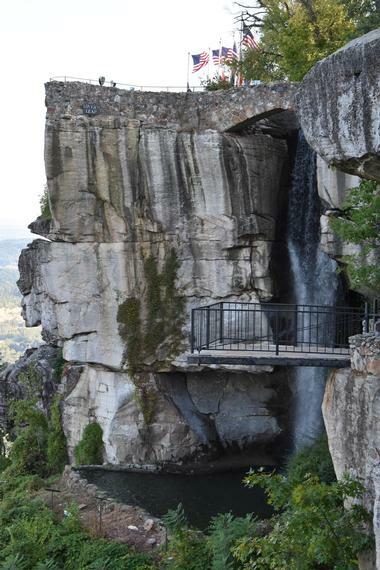 The latter include the Lover’s Leap rocky cliff, High Falls, and Fairyland Caverns. Curated entertainment includes a fantastical installation of fairytale scenes and the heart-stopping Swing-a-Long suspension rope bridge. Another notable staple of the gardens is its one-of-a-kind peregrine falcon nursing and release program. 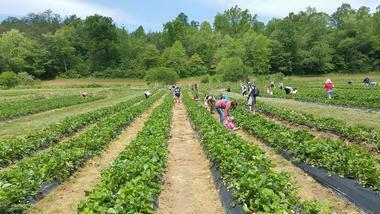 Mercier Orchards in Blue Ridge, Georgia, is a family-owned farm that has been in operation for over 70 years. The orchard produces a wide range of fruits and has many exciting attractions and events for visitors to enjoy. Guests can spend the day picking their own in-season fruits and then enjoy a tour of the orchard’s hard apple cider brewery. In addition to adult beverages, the owners also make great use of their fruits by incorporating them into sweet treats and baked goods for purchase on site. Considering that the orchard also has a deli that serves breakfast and lunch, it’s easy to make a trip to Mercier a full day out. Amicalola Falls State Park is unique in that it contains a trail leading to Springer Mountain, which is the southern endpoint of the famed Appalachian Trail. The state park is home to the gorgeous Amicalola Falls that give it is name as well as many other natural features that make it a popular destination with outdoors aficionados. Its well-equipped visitors center has maps of its trails, exhibits about the history and ecology of the area, and even live animals. For overnight stays, visitors have a number of accommodation options, from modest campgrounds to luxury hotels and even a backcountry lodge. 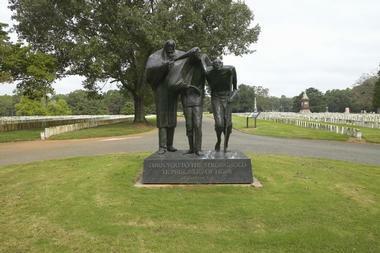 This historical park and site of military significance covers parts of both northern Georgia and southern Tennessee near the city of Chattanooga, which was a desirable strategic population center during the Civil War. At the time, Chattanooga was a major railroad hub and was considered an outlet to the rest of the Confederate territories. For several months in 1863, the Union and Confederate armies fought for control of the area, with Union soldiers ultimately emerging victorious and successfully pushing the Confederates southward. 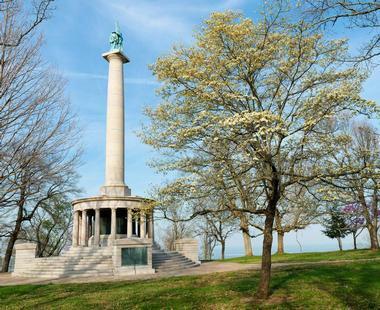 Today, rangers give guided tours of the battlefield to visitors who come to learn about its rich, significant history.